Hello, I said as I approached the reception desk in the palatial lobby of the five star hotel, I have a reservation to a “Grand Hotel”, but something tells me this isn’t the one. Either that, I added with a smile, or you guys have an all too humble star rating on booking sites. I gave the receptionist my details and he indeed confirmed that this wasn’t the hotel I was looking for. Great. Four hours earlier, at 9 in the morning, in the cab outside the towers in Pune, the driver Ganesh and I agreed on who knew the way and who didn’t. My hotel is somewhere near the Gateway of India, so if you don’t know the exact address you can take me to the gateway and I’ll help myself from there, I said. Ok ok, no problem, he replied and started the engine. Good, because this’ll be my first time in Mumbai after all, I laughed and settled in the backseat. 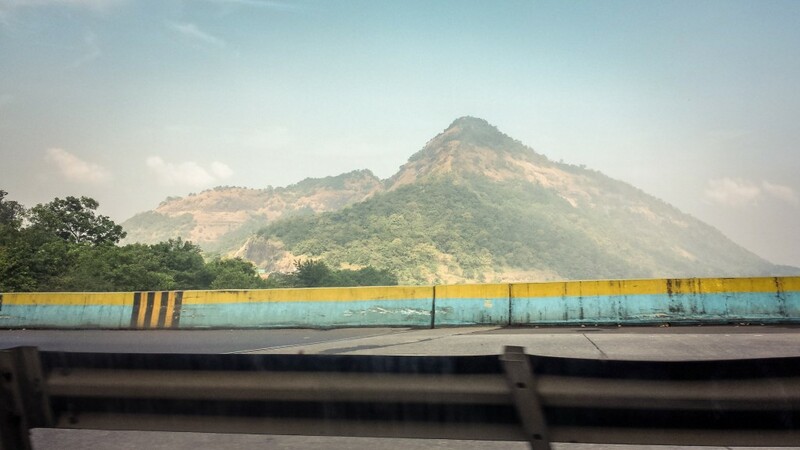 The drive wasn’t very far – 150 km – but the duration was lengthy, mainly because of the heavy traffic to be expected once we get into Navi-Mumbai. Ganesh put on the radio, on a channel which seemed to loop the same seven commercials constantly, with one song between every five cycles. A very strange format, who listens to this crap? I wondered while we did for at least the first hour. The change of scenery as we descended from the hills towards Mumbai presented some sights familiar from my arrival, from what seemed like much more than four weeks ago. The green plateau in Lonavala, overlooking the Khopoli valley, still looked beckoning. A destination for a weekend trip at some point perhaps? The traffic was slowing down steadily as we came closer to Navi-Mumbai. I took out my phone and studied the destination area in more detail. I was using the TripAdvisor app, in which I had starred the Grand Hotel, where I was going to stay. 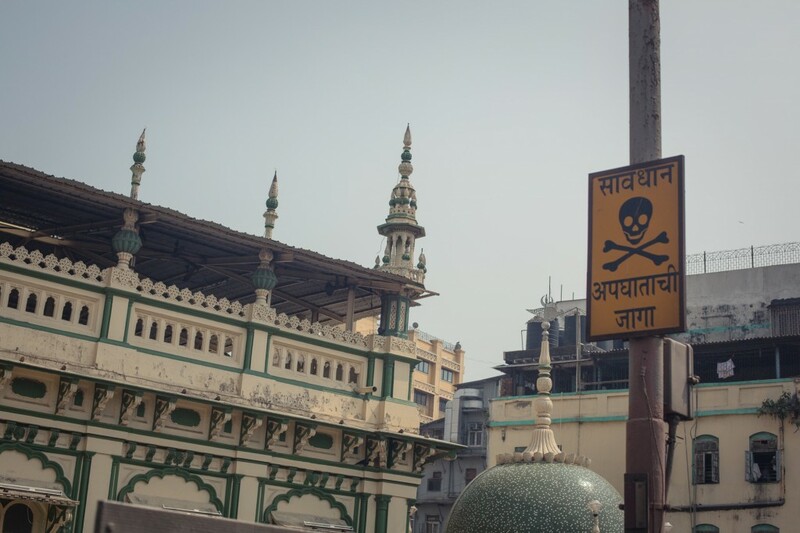 It was quite a bit south on the Mumbai peninsula, ensuring relative proximity to many key attractions. By the time we hit the Vashi bridge, connecting Navi-Mumbai to Mumbai, the driver asked me which way to go after the bridge. Look at map on phone, he said. I had to shake off the blank stare saying “are you kidding me?” before taking a look at the best route. I think for a while, not entirely comfortable with being the navigator on that failboat, and describe the general directions: head down to the Eastern Express Highway and then continue straight until we get quite close, I’ll tell you when to turn to sidestreets. After the bridge the traffic halted down to a crawl. At a big roundabout the driver suddenly decided to take one of the exits that wasn’t actually leading to a road. Off the tarmac, onto uneven gravel – a construction site. The map marker turned South and into a big blank area, my map was now useless. This is new road! Ganesh said, with a sense of accomplishment, like he had just pulled an ace out of his sleeve. So we headed up the gravel road, along a ridge, in between big machinery and tired workers. A while later, the cab stopped. Ganesh peered out over the landscape, and at the small valley separating us from the road network leading to the Expressway. This is wrong side, he said, slightly defeated. So we do a U-turn and head back down the hill, to the roundabout, and take a proper exit. The rest of the ride was not the most direct route, but long highways and many crowded streets later we arrived at the place marked by TripAdvisor. I thanked Ganesh, told him I’ll take it from here, and bid him farewell. As he sped off I reviewed the info I had: the Grand Hotel is somewhere close by, within 50 m, and I had a picture of it. An exact address too, but as I’ve learnt, street names carry a secondary importance here. It’s more about landmarks. Get a driver to a landmark and he’ll figure out the exact destination by asking the locals. Unable to find the hotel by doing a quick sweep, I started asking around. Everyone said there indeed is a grand hotel, but I needed to go down to the end of the block and a few hundred meters onwards. That’s strange, it’d place me off the map marker by a little under a kilometer, but allright. After more questions and confirmations I arrive at the closed gates of the ITC Grand, a twenty-something floors high tower of what looked like agreeable levels of luxury. Several pleasantly cordial guards and doormen later I step into the air-conditioned lobby and present my dilemma. This was clearly not the same Grand, and the receptionist agreed. He was wonderfully helpful and, after checking out the address details I had, offered to order me a cab that would take me to the right address. It was a 20 minute ride from there. He also asked if I wouldn’t rather have a room in their hotel, I looked around and said, you know what, if I didn’t have a non-cancellable reservation to the other one, I would. The price difference wasn’t even that much. Honestly though, in my plain orange t-shirt and black cargo shorts, I did feel a bit underdressed. Maybe next time, thanks. Funny coincidence. The hotel info I had in TripAdvisor was right, except that it was marked in the wrong location on the map. However, within a couple of hundred meters of that location there was another Grand Hotel. For someone being the first time in this huge metropolis, on streets that essentially have no names, this can be a very confusing thing. But by now I had the feeling that I had it sorted out. The local cab took me further South, towards Ballard Estate. On the way the traffic came to a full stop on an overpass next to busy market streets. Shops, lots of people, mosques, colors, dirt and grit. I was drawn to it, and marked it down on my map. 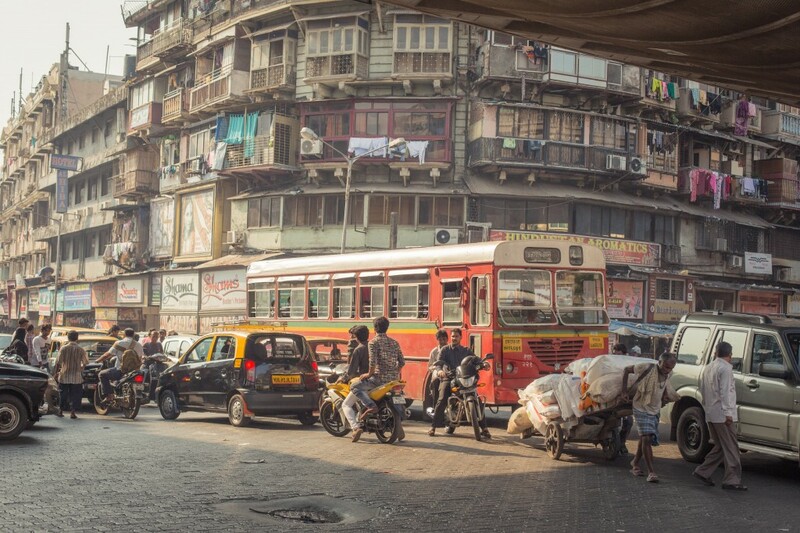 Bhendi Bazaar. 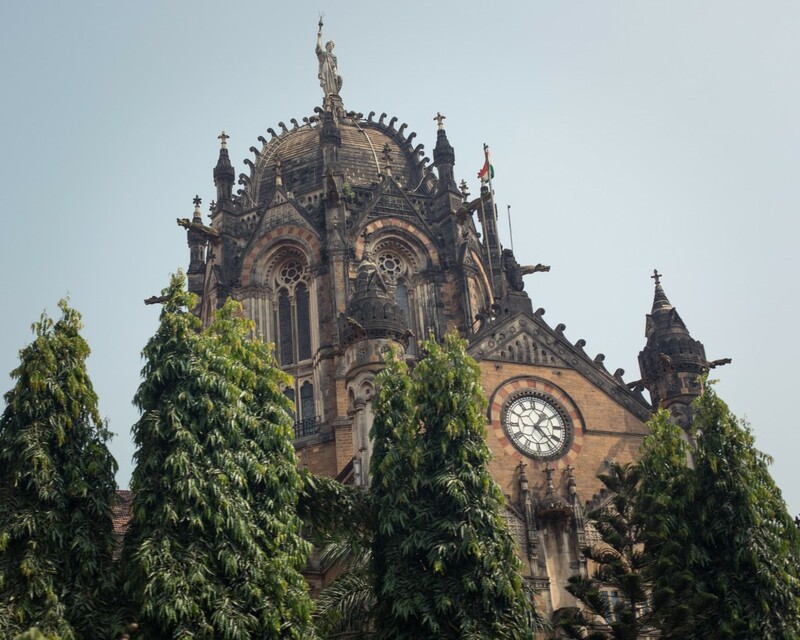 We continued down past Chhapravati Shivaji Terminus, also known as Victoria Station, and before I knew it the same humble three-star hotel I had reviewed in TripAdvisor stood in front of me. A charming old establishment, since 1926. I checked in, took a well-deserved five minute rest, and headed out again.